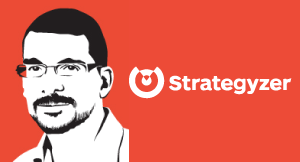 Alex Osterwalder explains the relationship between a value proposition and a business model. The value proposition must reflect customer needs and the business model addresses creating value for the supplier. Both are important. The business model is the big picture. The business model describes how you are creating value for your company. Right, because the business model helps you describe you know what’s the strategic blueprint to create a profit for your company. The value proposition has a very different focus. It describes how you are creating value for your customer. And a company that wants to succeed needs to succeed in both and a detailed picture focused on a customer – how do I creating value for my customer. And then in the bigger picture of how is that value proposition going to be embedded in the business model to create this value for me. Now some people like to say, well the value proposition is the most important. Well I wouldn’t say so because, you know that there are multiple examples out there were companies had great value propositions and still went bankrupt. Kodak invented or helped invented the digital camera. People love digital cameras. It didn’t prevent Kodak from going bankrupt, why? Because they didn’t have the business model for digital cameras, so you need to succeed in both, in how you are creating value for your customer, and how you are creating value for your business. It seems obvious, but what’s different today is that we have tools to reflect on those two things.